ok well i was lookin at sharingans tutorial and i remembered that a while ago i really wanted to make a tutorial but i never did cause before it was too much work to scan things in the past. well now i have my scanner here in my room so its the perfect opportunity to do this! so basically this is how i draw. this tutorial will hopefully help you fix your drawings along the way, rather than other tutorials that are very strict about how things are done. im very flexible in my art and hopefully this tutorial help you out in a thing or two. ok first step!! 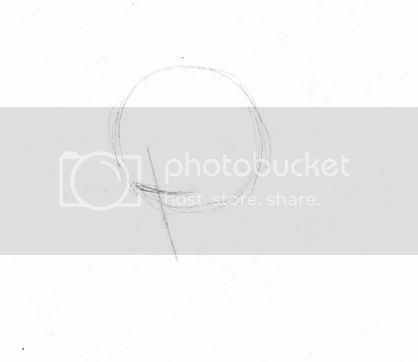 drawww a circle!! o0o0o0o pretty hard eh!! actually for a beginner it is pretty hard, thats why practice makes perfect. 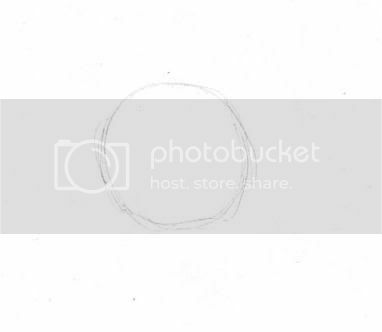 a tip: dont try to draw the circle with one line, dont be afraid to be sketchy, you can always clean it up later (i obviously dont however). i remember when i started out i couldnt draw circles when i started out so for a little bit i was actually drawing more square-like objects. its good to modify your technique if it helps you draw better. a lot of being an artist and having your own style is developing your own technique. but dont try to start developing your own techniques and styles right away! you will learn a lot more by taking it slow and studying other peoples work to know how you want your drawings to look like. ok these first few steps you've all most likely seen. since i learned how to draw anime off of pats tutorial, the way i start off my drawings will seem very much the same. this step is essentially planning out the head. 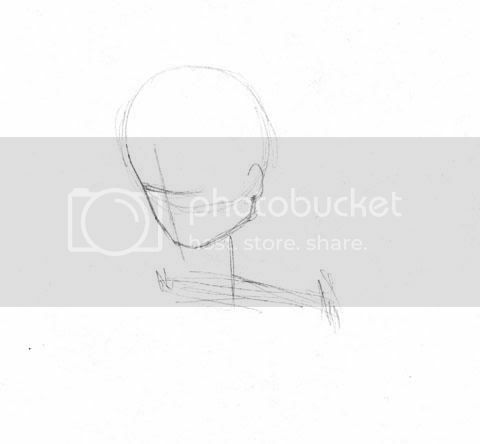 i always start off my drawings drawing the head, and which way its facing and etc. from this i decide if i want the body to be facing the same direction as the head or if i want the character to be looking sideways or whatever. those two lines will also help me figure out where i want the eyes and nose. 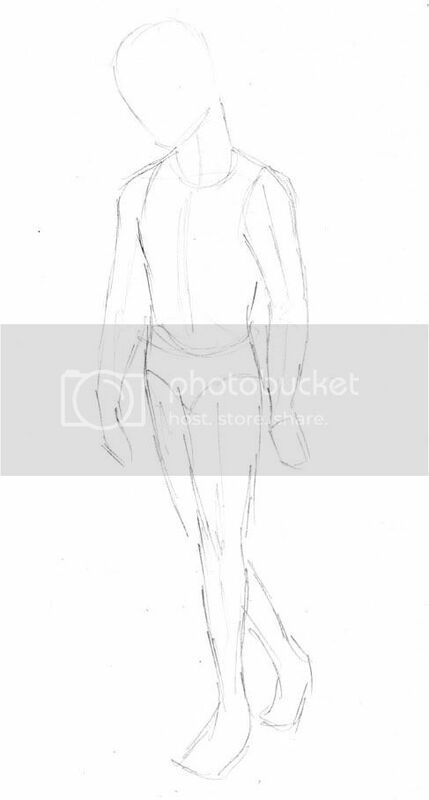 now this is just a really rough sketch of a stick man to very roughly get the image in my head of how the body picture is gonna look. just quickly draw it with light lines and small horizontal lines for the joints. As you can roughly see i drew 4 legs. this is not a mistake. what i was doing is drawing the body in different positions to see how i wanted the picture to look. i also did this with the shoulders and arm length. this technique should help you for action poses and etc so you dont have to erase a lot out of your final picture to get the pose right. now keep in mind this pose, the head and everything drawn so far is not all staying. this is just a rough outline on how i want the picture to look. this stage is a good time to quickly look it over for any mistakes that you might run into. for example ive noticed the head as it is now is way to big, im gonna have to either resize it or resize the whole body. obviously the head will be made smaller. another thing i didnt like about this pic is that the pose is just way too stiff, so im gonna be changing that too. hopefully thus far you dont have to make any sacrifices in any part of your drawing. what i mean by this is that sometimes you need to get rid of something that you really like for the sake of the final picture. for example if you draw a hand and you drew it reaaally well and your very happy with it. then when you look back and see that the arm makes it look dislocated and you have to erase it. you may not like it, but this is not uncommon. as you draw get ready to have to make decisions like that and keep in mind that not everything is going to stay. now this pic may not look like how i regularly draw this step. thats cause when i scanned this step i actually pressed the refresh button instead of the scan button, so i just traced the final copy. i think you guys should get the idea on what i did though. now usually i dont draw this "underwear" thing were he looks like hes wearing tighty whities and a wife beater, but for a beginner this may help getting a sort of 3-D image of the character. ooookayy! this is a big leap! from a blank dummy to a detailed personalized character! well ya i guess it is... but have no fear im gonna have more stuff up soon that will fill in what your probably confused about now. so back to the picture... a good artist always has to realize his mistakes! now im not saying im a good artist but right after i finished this drawing i realized a few slip ups. one being his left arm... his shoulder should be raised a bit more. and also that contrappasto thingy i didnt do, which kinda makes me look bad since i made a deal outta it and didnt do it in my own tutorial... but whatever it still looks good. so yea, thats the first part of my tutorial... i dont have much to add as a final thought except PRACTICE!! im pretty sure anyone can tell you that though. so! something else you should do! look at other peoples art! compare it to your own! ask yourself "what makes his or her art so much better than mine?" spot out the differences and try to change that about your own work. same thing when your going for a style. if you like some part of another artists style its not illegal to mix it in with your own! i wont lie i worshop Hiroaki Samura, creator of the blade of immortal manga series. ive taken a lot of things from him (or tried to anyway). so yea just go out there and do your thing! Last edited by mofo09 : 07-17-2005 at 11:11 PM. "I want two dogs, two cats, a big kitchen, and a welcome mat"
god tut mofo, im sure thatl help many of us, including me! SWEET just what i needed! i know some basic hiar stuff but i must know more.... after if it isnt to much to ask please make a hand n feet toturial! nice stuff mofo but something is really bothering you, you draw small feets everytime!! Looks like Tetsuo from Akira. The road to stupidity is paved with good intentions..
Last edited by Twisted Lullaby : 12-04-2009 at 01:35 PM.